Why did early humans do yoga? An exploration of HOW mindfulness practices such as yoga and meditation transform the body and mind seems inextricably tied to the question of, “WHY, in the first place, would anyone want to sit for days and meditate?” What was it that motivated early humans and early civilizations to engage in these so-called “spiritual” practices? Why does a practice like yoga engage people on a self-reflective or spiritual level? As a biologist, I’d like to explore the mental and physical transformations that occur when one practices (and practices) yoga and meditation – so perhaps a place to begin this exploration is with a scientific hypothesis about the WHY, that in some ways might be testable insofar as it might point to certain mental and physical processes – which themselves – might function as targets or recipient processes that are engaged in the course of practice (the HOW). Religion thus met the newly evolving human need to understand and control life. Religion serves the same purposes as science and the arts – “the extraction of order from the mysteries of the material world,” as Wilson puts it – but in the prescientific era there was no other source of order except for philosophy, which was comprehensible only to a favored few and in any case was nowhere nearly as emotionally satisfying as religion. Still another major function of religion was to act as a binding and cementing social force. I quote Wilson again: “Religion is … empowered mightily by its principal ally, tribalism. The shamans and priests implore us in somber cadence, Trust in the sacred rituals, become part of the immortal force, you are one of us.” Religious propitiation and sacrifice – near-universals of religious practice – are acts of submission to a dominant being and dominance hierarchy. For all these reasons, says Wilson, “Acceptance of the supernatural conveyed a great advantage throughout prehistory, when the brain was evolving.” The human mind evolved to believe in the gods even as religious institutions became built-ins of society. 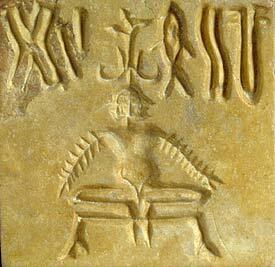 The picture above is a seal unearthed in the 5,000-year-old Mohenjo-daro excavation, showing a human-like form sitting in a yogic pose.